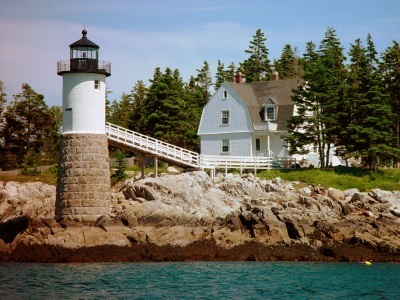 Our beloved lighthouse has guided fishermen home to the harbor since 1907. Originally manned by a lighthouse keeper’s family, the big house is now an inn, but the now-automated lighthouse is owned by the town; there are occasional docent guided tours but most people enjoy it from the water, either from the passing mailboat, fishing boats or personal watercraft. Currently the Town has an on-going campaign to restore the lighthouse and return a huge fog bell to the tower’s seaward side. On his search to understand the allure of lighthouses, author Jeffrey Burke recounts a bouillabaisse of history, sea tales, and bizarre encounters that re-routed the life trajectory of so many guests who passed through his lighthouse inn – including his own. Over the years, the pronunciation of “Isle au Haut” has drifted considerably. Nowadays, people who have spent time on the island pronounce it “i-la-HO.” In a similar vein, one of the inlets on Isle au Haut went from “Ciel Trappe” (Sky Trap) to Seal Trap- often leading people to erroneous conclusions.